Armed with a National Trust Pass, I could wander the British countryside for weeks on end. I never seem to get tired of old houses. Above is Lytes Cary Manor, begun in the 1400s and added to over the centuries. (Did it rain while I was there? Just a little. As Jane Austen’s heroine Anne Elliot told dreamboat Captain Wentworth in Persuasion, “It’s nothing that I regard.” She wanted him to walk her home in the rain). 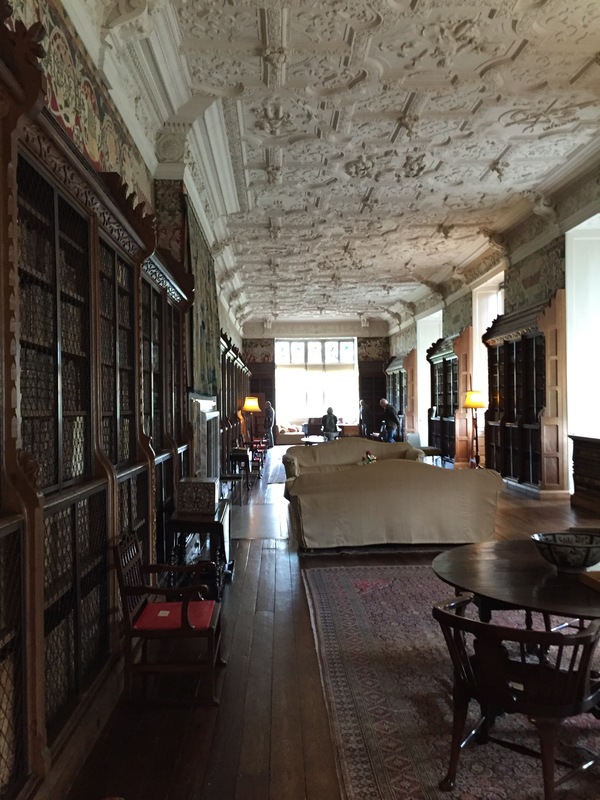 Lytes Cary still has its Great Room from the 1400s. The Lyte family used to eat at the long table on the dais at the end of the room. Each ancient roof beam is supported by an angel holding the coat of arms of the Lyte family. Carved owls in the entry passage look a bit newer, but in a house so old, whooooo knows? Of course I also like much grander mansions such as Harewood. Many of them still have deep-pocketed owners with the means to bring in modern and avante-garde art. But National Trust properties, which have often come from families hard hit by misfortune and crushing inheritance taxes, lovingly preserve the old stuff that came with the property. The mirror frame above, at Lytes Cary, was worked up in the old needlework technique of “stumpwork” in the 1600s. In the early 1900s, a relative of the newest owner learned the technique and added some panels, including the view of the house in the upper left-hand panel. A pair of mysterious old leather mannikins, about 3 feet tall, stand beside the fireplace in the Great Parlor. Their purpose? Possibly to fill chairs in case the dining table would otherwise have 13 guests. Or possibly they could have been set up in windows to make thieves think the house was occupied when the family was away. The fireplace settee is very Downton Abbey, don’t you think? 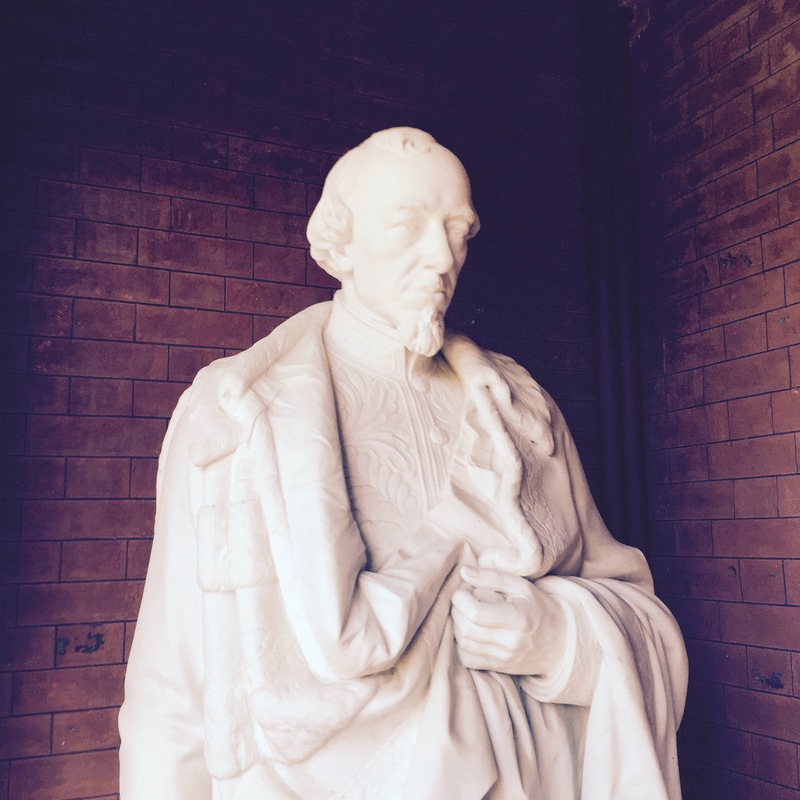 Sir Walter Jenner, the last owner of Lytes Cary, was the son of Queen Victoria’s physician. The Lyte family had been forced to abandon the property way back in 1755. Subsequent owners and tenants allowed the house to fall into decay. Sir Walter bought what was left of it in 1907 and set to work restoring it. He kept peacocks which used to scratch at the door for handouts at teatime. Now there’s an enormous peacock topiary beside the front door. Being abandoned actually saved the house. In Victorian times, rich people busily “improved” medieval manor houses, much the way people today install new Sheetrock walls to cover antique stone or paneling. That’s rare and valuable “linen fold” carved oak medieval paneling above, original to the house. A little parlor has a “squint:” a tiny narrow window. It looks like this from outside. The squint is positioned so that a person could stay inside the house by the fire and still see Mass being celebrated in the little chapel next to the house–which most likely happened regularly in medieval times. 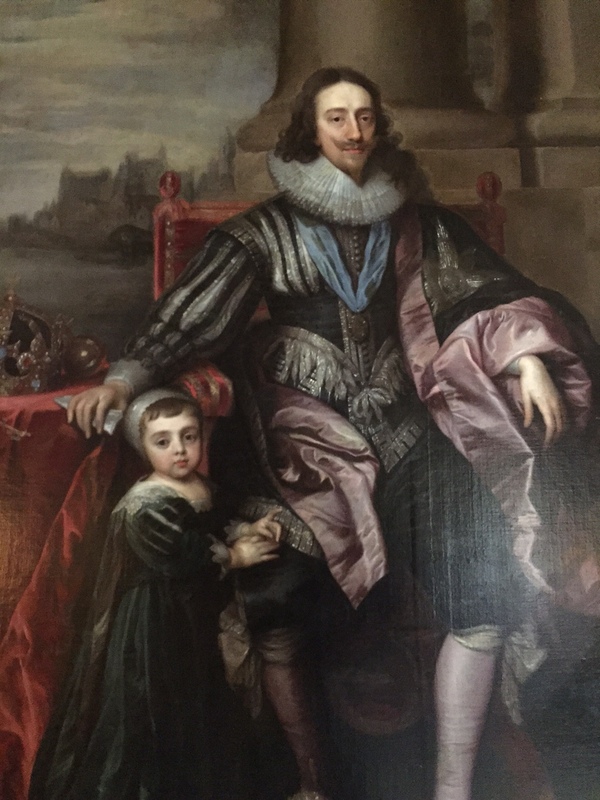 Sir Walter lived happily at Lytes Cary for decades with his wife Flora and their only child, Esme. Sadly, Esme died at age 37 from pneumonia after catching a chill while out riding. She was a keen hunter, serving as Master of the Sparkford Vale Harriers. She died in 1932. (Sir Alexander Fleming had discovered penicillin in 1928, but antibiotics were not yet in wide use). 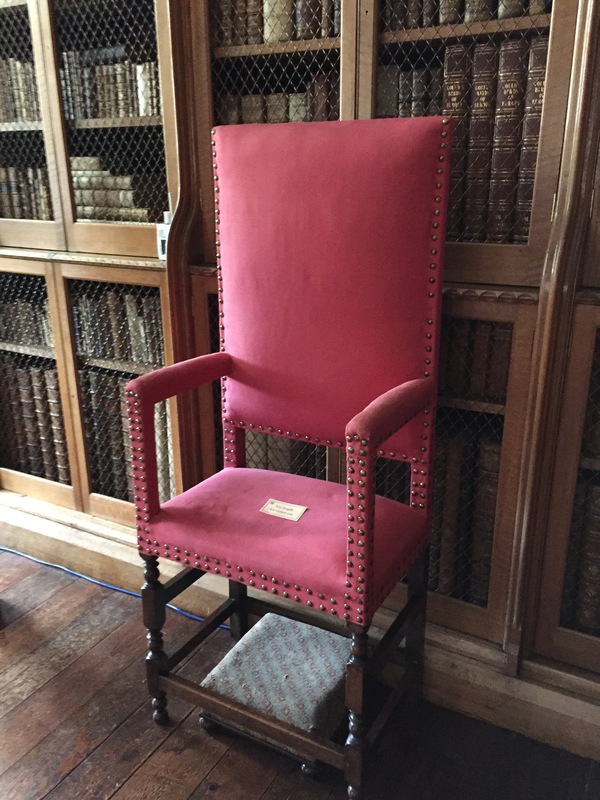 When Sir Walter decided to will Lytes Cary to the National Trust at age 88, the director came out to the house to see him, and found him in his canopied bed in nightcap and dressing gown. The house was chilly and drafty, as it was in medieval times. Another bedroom features a “campaign bed” from around 1800. From Napoleonic times up through the Victorian era, aristocratic military officers who were used to comfy canopied beds ordered custom-made fold-up ones to take with them to training camp and even to battlefields. 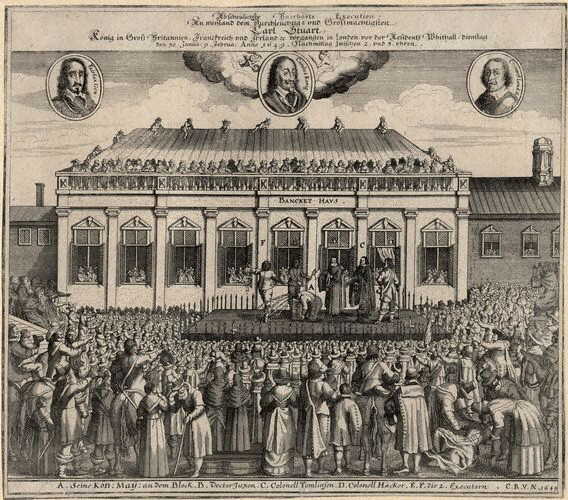 Why not live in the style to which they were accustomed? The British love to visit old houses, and they love their dogs. Most National Trust properties encourage dog-walking on the grounds. So do a lot of privately-owned mansions, like Chatsworth. (I also love the very British wordage beside this gateway, “Dead Slow, Hoot.” Translation: If you’re driving into the courtyard, roll ahead at a snail’s pace and lean on your car horn). National Trust properties almost always have teashops where dogs are welcome at the outdoor tables. The dogs are always polite, though they do cadge table scraps. It’s easy to strike up a conversation when I stop to pet someone’s dog. I meet a lot of lovely people that way. Getting to these out-of-the way places requires a brave driver. Country roads are narrow, often only a single lane with occasional pull-offs for when cars meet. And even when there are two lanes, we Americans are driving on THE WRONG SIDE. I wouldn’t do it myself, especially with jet lag. But my husband, bless his heart, thinks nothing of it. I’m the navigator. I used to maneuver three or four maps at a time to locate things. Navigation got infinitely easier when we acquired a Garmin GPS device with updatable maps. I just plug in the name or the postal code of the destination and we’re pretty likely to get there by following the voice commands and the purple line on the screen. (Note to self: write a post called “How Garmin GPS Saved My Marriage”). Still, sometimes Garmin gets us into a pickle. Wait, Voice from the Satellite, you really mean we should do a loop-de-loop and then leave the road? Excuse me while I check my paper map. English country houses: Dusty, Drafty, Doggy-Doting. And sometimes the Directions are Dodgy. It’s worth all the trouble. Yesterday, daffodils, asters and bluebells were in glorious bloom at Lytes Cary. 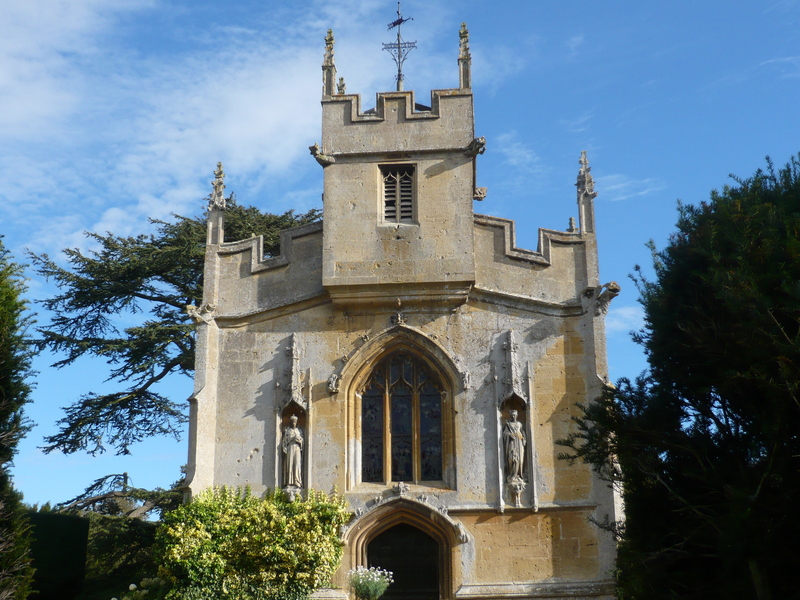 This entry was posted in British Isles, England, Explore Europe, Historic Homes, Historical Figures, Why I Love England and tagged Downton Abbey, Lytes Cary Manor, medieval manor houses, National Trust, Sir Walter Jenner on April 9, 2018 by Claudia Suzan Carley. 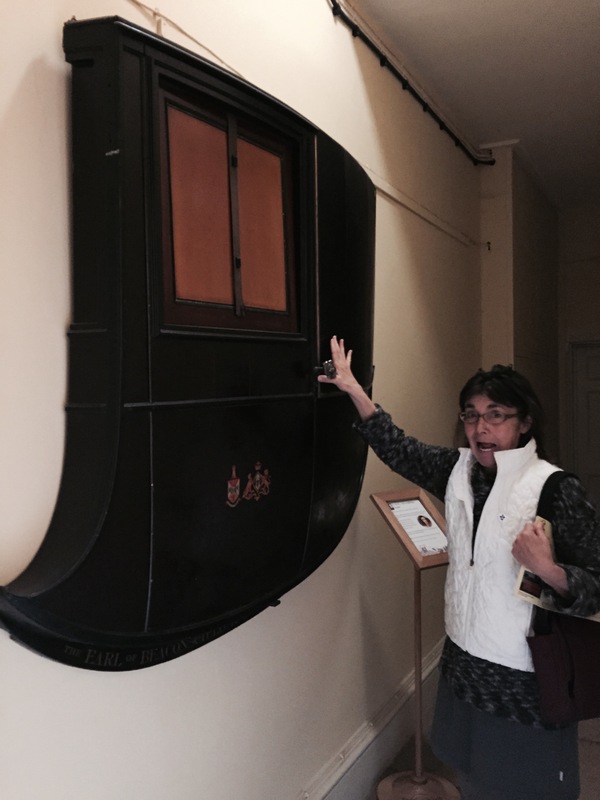 Why is a Victorian carriage door prominently displayed on a wall at Hughenden, the country home of Queen Victoria’s friend and Prime Minister, Benjamin Disraeli? 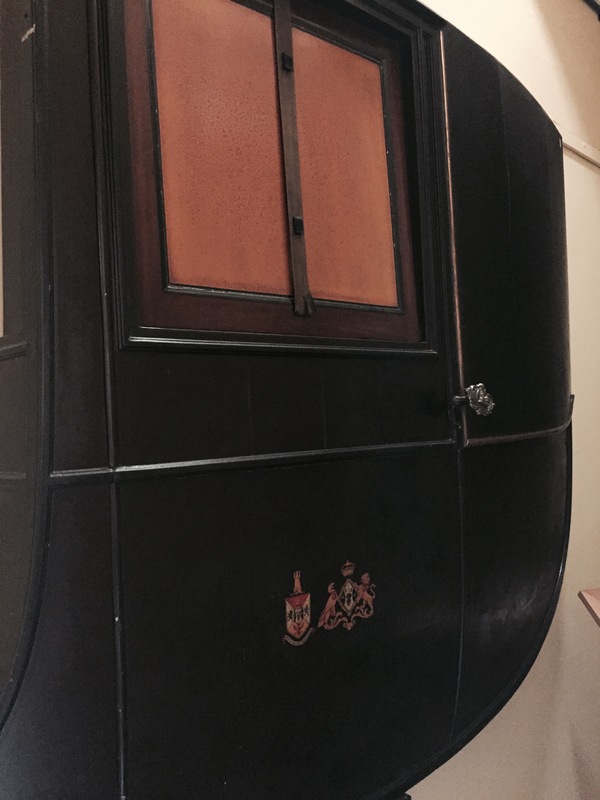 The Prime Minister himself removed it from the carriage and preserved it as a tribute to his wife, Mary Anne. One evening the ambitious politician and his doting wife set off from his London house to Parliament, where he was to deliver a very important speech. When the carriage door was closed, it slammed shut on Mary Anne’s thumb. What did she do? She suffered in silence, all the way to Westminster. She didn’t want to upset the man before his speech. A placard next to the carriage door explains that Mary Anne said not a word until Disraeli was safely out of the carriage and on his way into the corridors of power. The placard remarks drily that her words when her thumb was released were not recorded. Mary Anne was 12 years older than her husband, and the marriage began as one of convenience. But it grew into a true love match. What Disraeli needed was a rich wife. He met Mary Anne Wyndham Lewis in 1832, when she was just another older married woman he enjoyed flirting with. He thought her “a pretty little woman, a flirt and a rattle” which according to the guidebook meant “incessant chatterer.” But her deep-pocketed husband obligingly died in 1838, leaving her a rich widow. Her appeal increased and Disraeli married her in 1839. Disraeli soon learned what a treasure he had found. He wrote, “There was no care which she could not mitigate, and no difficulty which she could not face. She was the most cheerful and the most courageous woman I ever knew.” High praise indeed; Disraeli had known and depended on many, many women in his rise to power in Victorian England. 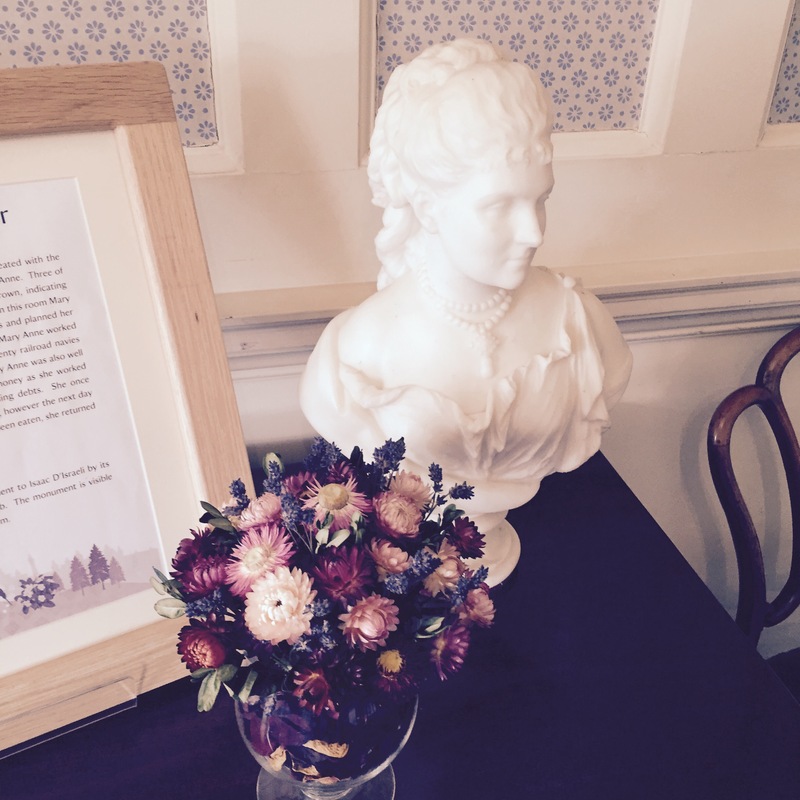 A visit to Hughenden is a window into the Victorian past. The estate is under the care of the National Trust, and beyond the quintessentially Victorian rooms there’s a surprise, new since I first visited years ago. The estate was a secret location for surveillance work which was crucial to victory in World War II. This work was so secret that not even the National Trust knew a thing about it until very recently. I’ll be writing about what went on in the wartime rooms and the icehouse soon. This entry was posted in British Isles, England, Historic Homes, Historical Figures, History, Literature, Uncategorized, Why I Love England, Writers and tagged "Vivian Grey", Benjamin Disraeli, Hughenden, National Trust, Queen Victoria on February 2, 2016 by Claudia Suzan Carley. Last week the fine actor Mark Rylance finished the Guthrie Theater run of his play Nice Fish, (co-written with the Duluth poet Louis Jenkins). Minneapolis will miss him, but I want to recommend his 1995 film Angels and Insects. I think I saw Mr. Rylance on stage years ago in England, but this excellent movie is the first time I remember seeing him. The movie is based on A.S. Byatt’s novella Morpho Eugenia, and she participated in writing the screenplay. Mark Rylance plays a penniless naturalist, William Adamson. He is just back from years studying animals and insects along the Amazon. Almost all his possessions were lost in a shipwreck on his way home to England, so he counts himself lucky to find a job helping a rich Victorian man catalog his own collections. 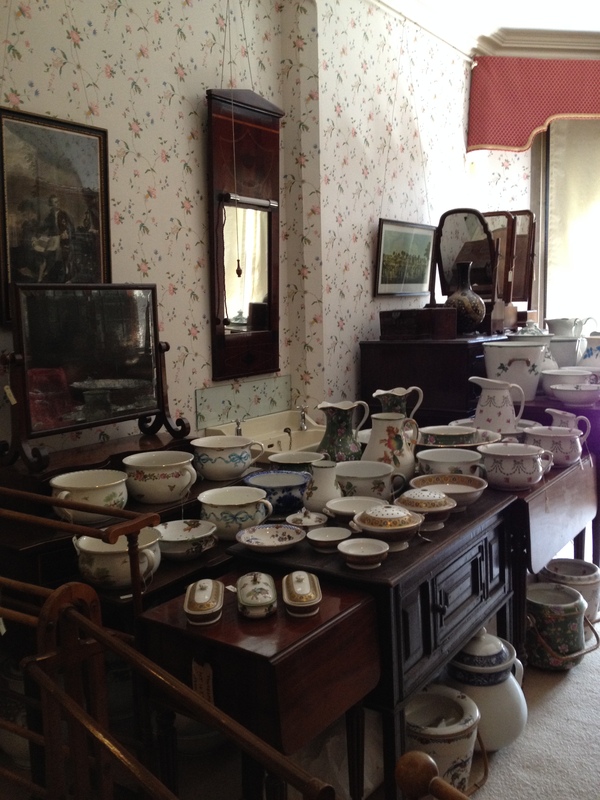 The Victorians were great ones for collections, of course. Every respectable country home had shelves full of curiosities. Patsy Kensit plays a somewhat dimwitted and seriously messed-up daughter of the family. Kristin Scott Thomas plays a razor-sharp governess. William Adamson finds himself between them. Of course, complications ensue. Mr. Rylance, as William Adamson, steals every scene with his quiet dignity that clearly covers a passionate nature. He is the second-most intelligent person on the premises, and yet he falls into a trap that an outsider can see from a mile away. As always, love is blind. What I find fascinating about the movie is the depiction of social classes in a grand country house which is very similar to Downton Abbey. 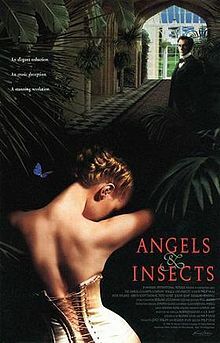 Instead of the formal but friendly relations depicted in the TV series, the servants in Angels and Insects are supposed to either grovel or turn invisible. When a housemaid encounters a family member in a corridor, the housemaid has to immediately turn and face the wall until the family member passes. And William Adamson has to rescue a maid from sexual abuse by a haughty family member. I have to wonder whether the TV series or the movie has the more accurate depiction of master/servant behavior. Bedroom arrangements are interesting, too. In Downton Abbey, Lady Mary teases her parents for sharing a bedroom. The penniless William Adamson has no such luck. When he marries the daughter of the house, he gets certain privileges, but he always knows his place. He is given a small bachelor-like room adjoining his heiress bride’s bedroom. However, he is only allowed into her grand bedroom when she has her maid unlock the door in between. If he is not welcome, he finds himself standing in his nightshirt before a silent locked door. The movie was filmed at Arbury Hall in Nuneaton, Warwickshire. The descendants of the founding families still occupy it. 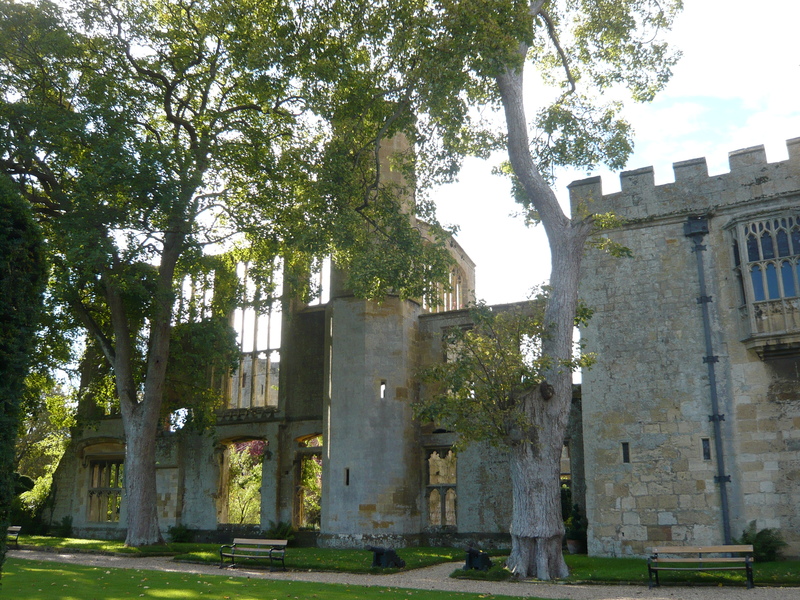 It is not part of the National Trust, which in modern times means it has to be run as a money-making enterprise. 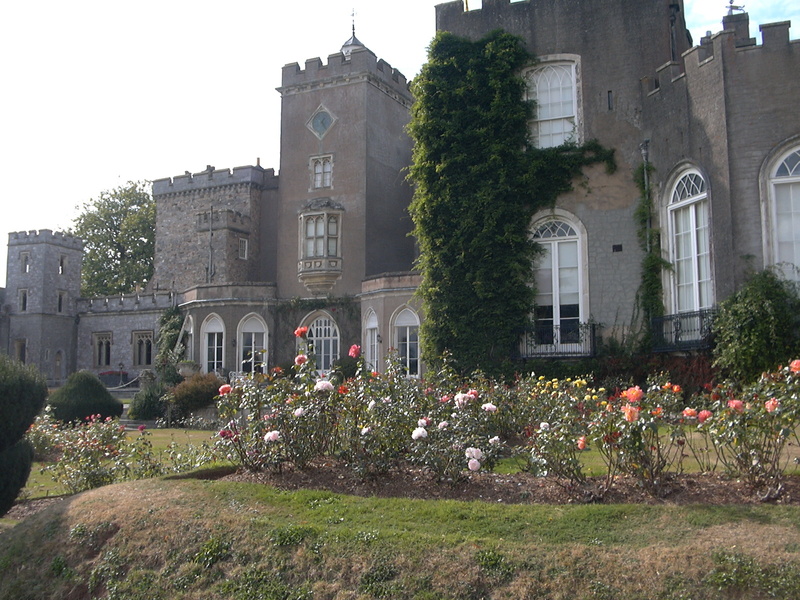 Like many stately homes, it is now used for corporate events and weddings. 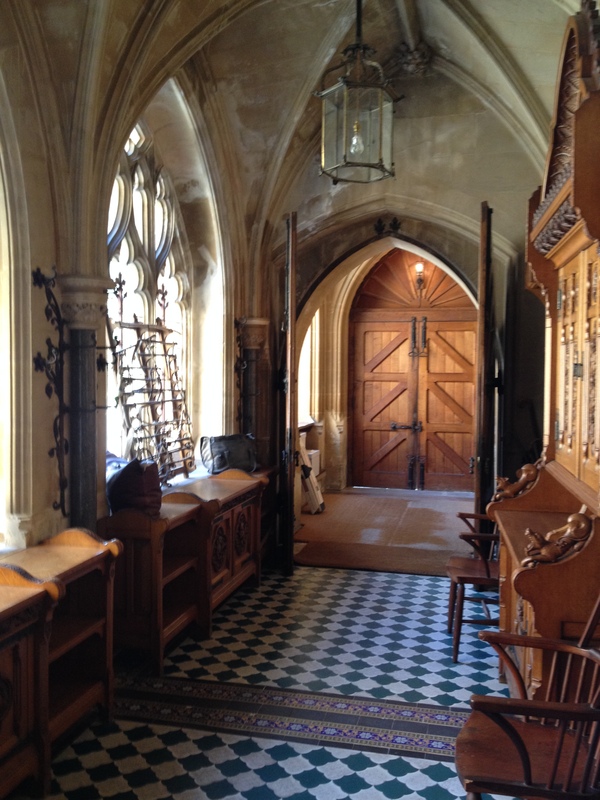 The neo-Gothic rooms shown on the estate’s website are grand indeed. Visiting hours are limited, but I’m putting it on my list for my next trip. The 19th century writer George Eliot (Mary Anne Evans) was born on the estate. Her father worked as a manager there. She wrote about the estate as “Cheverel Manor” in her book Scenes of Clerical Life. For stellar acting and a fascinating look at Victorian life, check out the movie Angels and Insects. 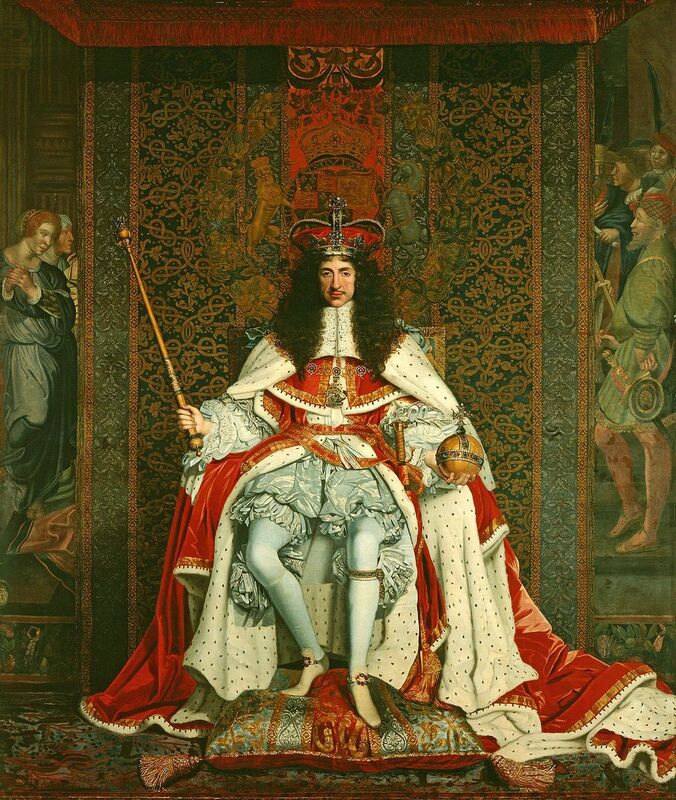 And join me next time for more explorations into the art and history of Europe–and the British Isles. 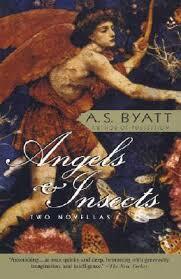 This entry was posted in Art, British Isles, England and tagged " A.S. Byatt, "Angels and Insects, "Morpho Eugenia, "Scenes of Clerical Life", Arbury Hall, Cheverel Manor, Coventry, Downton Abbey, English stately homes, George Eliot, Kristin Scott Thomas, Lady Mary, Mark Rylance, Mary Anne Evans, National Trust, neo-Gothic architecture, Nuneaton, Patsy Kensit, servants in Victorian England, Victorian bedroom arrangements, Weddings at Arbury Hall, William Adamson on May 22, 2013 by Claudia Suzan Carley.